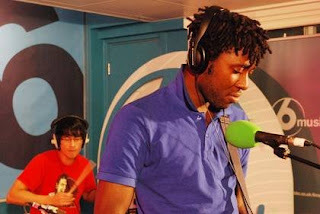 The whole blogosphere imploded at the news that Bloc Party were suddenly releasing an album. Having only announced their intentions on the 18th, the 21st saw their third studio album ('Intimacy') become available for download. Except it had a few tracks missing. Those will appear on the cd version, coming out October 27. In the midst of all that, the band entered Steve Lamacq's Hub (oo err) for a BBC 6Music Session. The brass heavy 'Mercury' single divided opinion and with previous single 'Flux' in mind, many expected that the new album would be a significant departure from the Bloc Party we had seen in the past. Judging from the tracks on offer currently, that doesn't really appear to be the case with the experimental moments being far from overwhelming. So you can preorder the cd version for about a tenner on blocparty.com and receive the mp3s now but as I mentioned before the cd will have some extra tracks. Until then, I don't really want to play my cards but let me know what you think so far if you wish. p.s note the Andrew W.K t-shirt in the photo. Awesome. Oh and if you get a chance, vote for me in the [BT Digital Music Awards]. I promise more exciting/individual posts. Cheers.